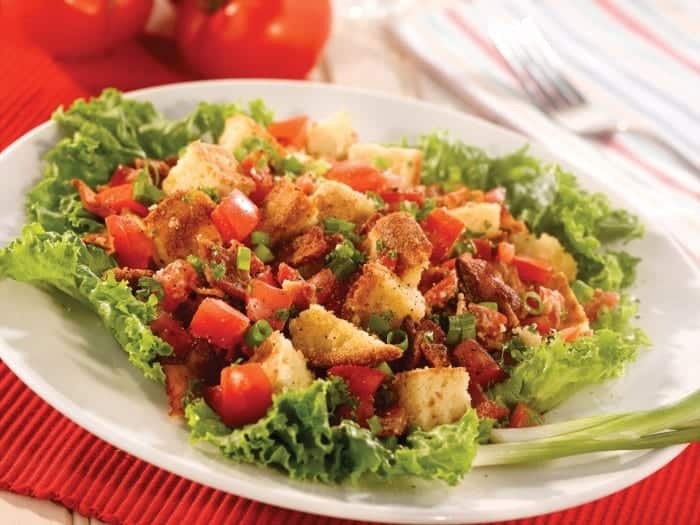 This BLT Cornbread Salad is delicious you won’t be able to keep you hands off of it! One of our favorite salad recipes packed with the best flavors! BLT recipes are some of our favorites to create! This cornbread salad has got it all! 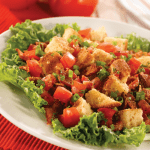 Bacon, lettuce, tomatoes, onion….it’s so flavorful and amazing! Be sure to try our Quinoa Party Salad too! Follow Picky Palate on Instagram for daily recipe inspirtation! This year marks the 20th Anniversary of the National Cornbread Festival which will be held April 23-24th in South Pittsburg TN. This is an exciting milestone for cornbread and what better way to celebrate than by sharing some favorite cornbread recipes?! To celebrate this year, I wanted to share this gorgeous BLT Cornbread Salad from the Martha White Website. Wait until try this!! Packed with all of your BLT flavors. This salad could not be more tasty if it tried. HEAT oven to 450°F. Spray a 10-inch cast iron skillet with no-stick cooking spray; place in oven for 7 to 8 minutes or until hot. BEAT egg in medium bowl. Add all remaining cornbread ingredients; mix well. Pour into prepared hot skillet. Bake 10 to 15 minutes or until golden brown. Cool 20 minutes while making salad. COOK bacon in large skillet over medium heat until crisp. Drain on paper towels. COMBINE cooked bacon, tomatoes, onion and parsley in large bowl. Add mayonnaise and pepper; mix to coat. Cut cornbread into 1/2-inch pieces. Add cornbread to salad; toss gently to mix. Cover tightly; refrigerate 2 to 3 hours or overnight before serving. Serve over lettuce, if desired. So cool that you won with your recipe! Still going strong with the cornbread recipes 😉 Such a smart idea to turn a sandwich into a salad! It looks delicious. I’m pretty sure that any salad packed with cornbread and bacon is a salad I can get behind!!! OMG — yum!! I love a cornbread salad it looks awesome Jenny! I don’t have a cast iron skillet, how can I make the bread otherwise? Thanks much, looks delicious. Also, after refrigerating, does it get soggy at all? Was going to make for an office potluck luncheon. 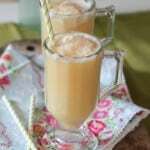 Your winning recipe is still one of my favorites! So unique and the taste is phenomenal! Bacon always makes everything better. I like this salad just as much as the layered ones. Love me some Cornbread Salad! This looks delicious, Jenny! YUM – bacon makes everything better! This would be perfect for a summer potluck. You are the cutest! 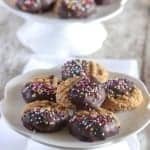 I love that you develop all of these winning recipes! This salad looks so good!! Cornbread AND salad AND BLT goodness sounds like a winning combination to me! Can’t wait to try this delicious spring time salad recipe! I LOVE the idea of cornbread croutons!!! 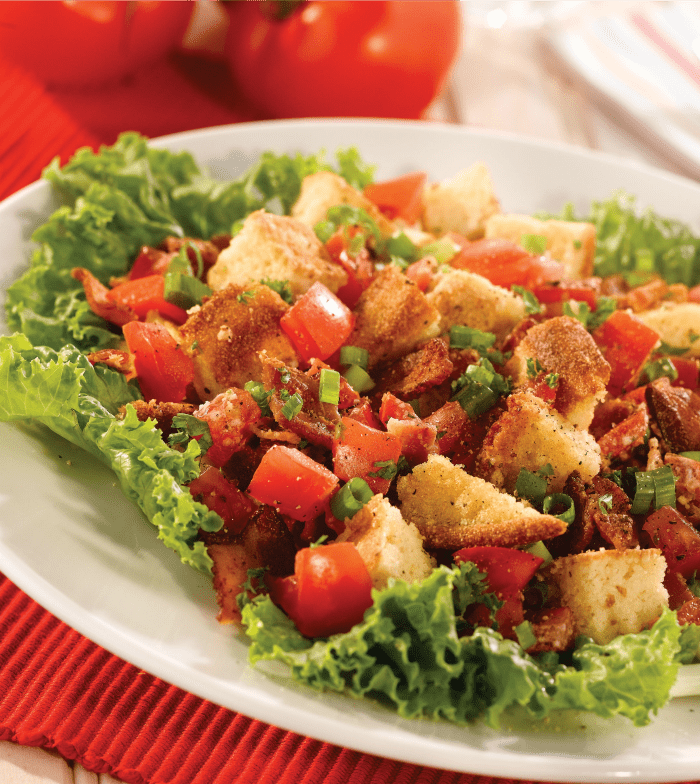 Cornbread croutons sound like perfection! Great take on a BLT salad! 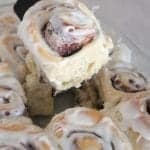 A cornbread festival – now that’s something I need to find my way to! What a gorgeous salad this is, and you can never go wrong with bacon and cornbread. YOu can’t beat cornbread!! And what a great way to change it up a bit!! This is one delicious looking salad! Love the blt twist! up very fast! Whaat web hozt are you the usage of? This is very tasty and sweet salad for breakfast purpose.